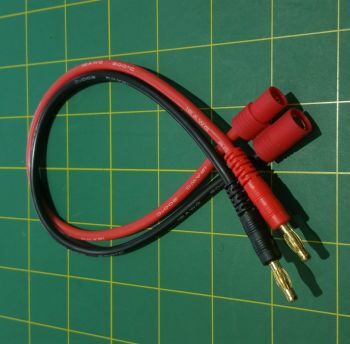 OSE Charger Output Cable for OSE-qs6p Bullet Connectors. Over 12" (300mm) long, 12 ga silicone wire, two 4mm Male Banana Plugs attached one end, and OSE-qs6p bullet connector soldered on the other end. -Male OSE-qs6p on positive end, Female OSE-qs6p on negative end.